Marlanda Dekine aka Sapient Soul is a Poet, Licensed Master Social Worker, and Artistic Activist, currently residing in Spartanburg, South Carolina. Originally from Georgetown, South Carolina, she attended Furman University and chose to reside in the Upstate area following her graduation. She is the Founder and Past Member of Furman University’s Poetry Club, Poetic Noise. Sapient Soul is the Co-Founder and Director of Spoken Word Spartanburg (www.spokenwordspartanburg.com), a nonprofit organization that fuses the spoken word art form and activism through various community projects. These projects include Build A Library, where the youth are given free books and encouraged to build their own personal libraries; Poetry and Conversation, where individuals of all ages, cultures, and walks of life are encouraged to gather and discuss race-related issues; as well as Wordplay Thursdays, a bi-monthly open mic and slam poetry show. 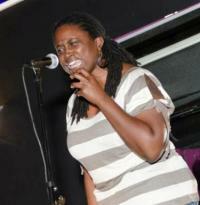 She is a member of Spartanburg’s first ever competitive poetry slam team, Old Soul. She has performed throughout the country, including Denver, Chicago, Atlanta, DC, and more. Sapient Soul is the 2012 Queen of the South champion and the 2013 Soul Sista Atlanta champion. She is also the Co-Founder of the annual poetry slam tournament, Slam Madness (www.slammadness.com), in which 32 poets have competed every March since 2011 in a head-to-head, weekend long, bracket style poetry slam for cash prizes. Sapient Soul is true to the meaning behind her stage name. Every word has been dipped in the wisdom and truth that she has been given. Her soul’s purpose is to connect with you through them.